A natural technique to select variables in the context of generalized linear models is to use a stepŵise procedure. It is natural, but contreversial, as discussed by Frank Harrell in a great post, clearly worth reading. Frank mentioned about 10 points against a stepwise procedure. 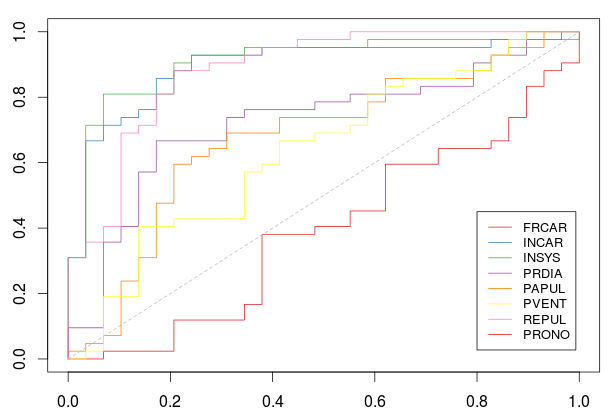 It yields R-squared values that are badly biased to be high. The F and chi-squared tests quoted next to each variable on the printout do not have the claimed distribution. The method yields confidence intervals for effects and predicted values that are falsely narrow (see Altman and Andersen (1989)). 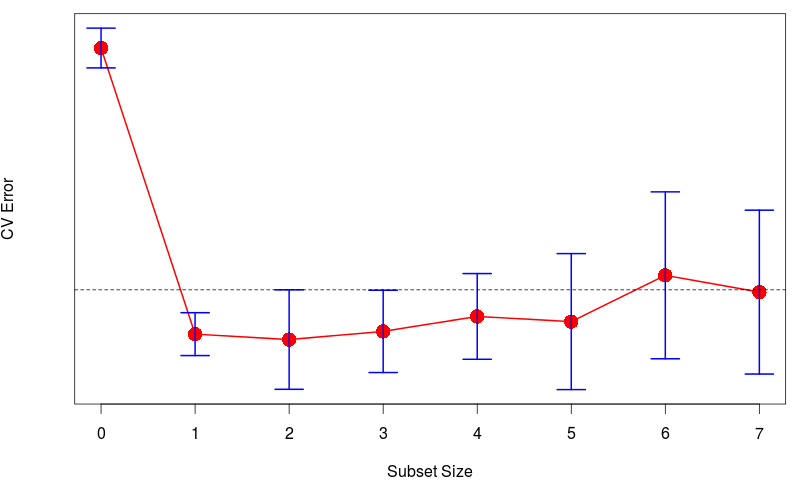 It yields p-values that do not have the proper meaning, and the proper correction for them is a difficult problem. It gives biased regression coefficients that need shrinkage (the coefficients for remaining variables are too large (see Tibshirani (1996)). It has severe problems in the presence of collinearity. It is based on methods (e.g., F tests for nested models) that were intended to be used to test prespecified hypotheses. Increasing the sample size does not help very much (see Derksen and Keselman (1992)). It allows us to not think about the problem. where we have observations from people entering E.R., because of a (potential) infarctus, and we want to understand who did survive, and to build a predictive model. With those two approaches, we have the same story: the most important variable (or say with the highest predictive value) is REPUL. And we can improve the model by adding INCAR. And that’s it. 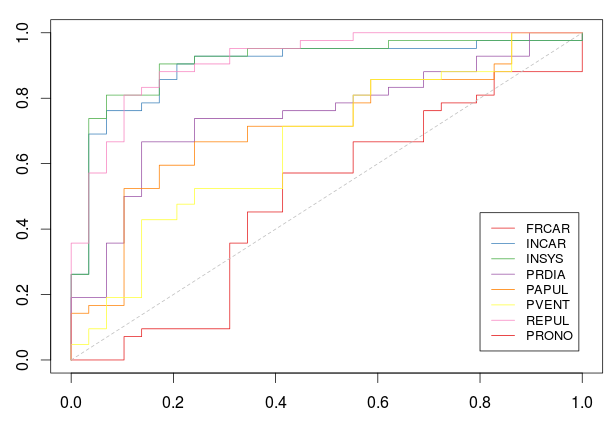 We can get a good model with those two covariates. 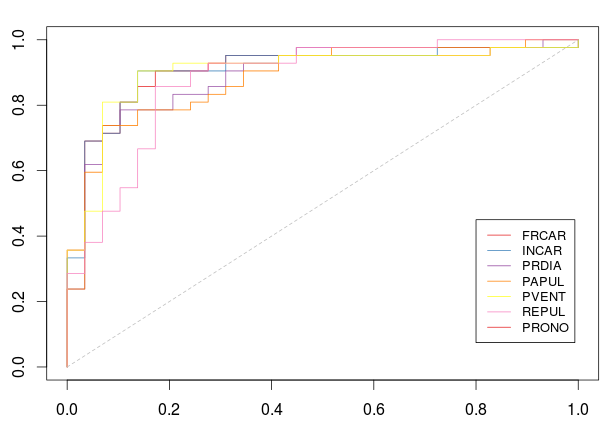 Now, consider a stepwise procedure: we keep that ‘best’ variable in our model, and we try to add another one. We were already quite good. 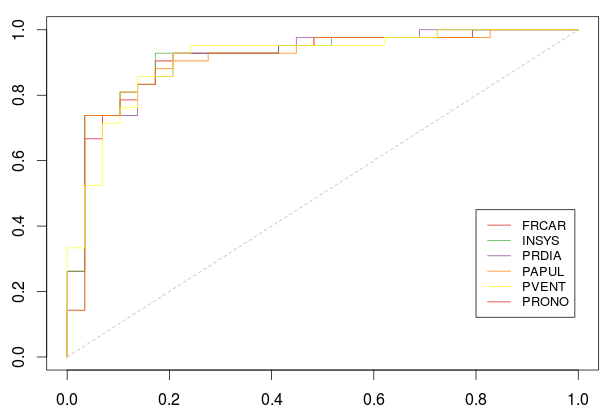 And we might expect to find another variable that will increase the predictive power of our classifier. With that stepwise algorithm, the best strategy is to keep, first, REPUL, and then to add INCAR. Which is consistent with the stepwise procedure using Akaike Information Criterion. An alternative could be to select the best pair among all possible pairs. It will be time consuming, but it can be used to avoid the stepwise drawback. which is different, compared with the one we got above. What is odd here is that we get a smaller AUC than the ones we got at step 2 in the stepwise procedure. Nevertheless, even with a few observations (our dataset is rather small here), it is time consuming to look at all ROC curves, for all pairs. An alternative might be to use –Fold Cross Validation. One has to check about the efficiency, especially with a large dataset. Here, the first variable that appears in the tree construction is INSYS, and the second on is REPUL. Which is rather different with what we got above. But using one tree is maybe not sufficient. 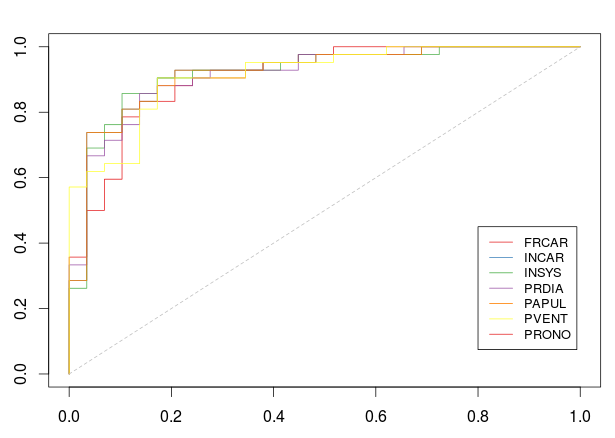 One can use the variable importance function (described in a previous post) obtained using random forests. Here, we have the same story as the one we got with a simple tree: the ‘most important’ variable is INSYS while the second one is REPUL. But here, we consider tree based predictors. And not a logistic regression.